Travel is fun. Sometimes it brings new creative ideas and other times it reinforces your own. 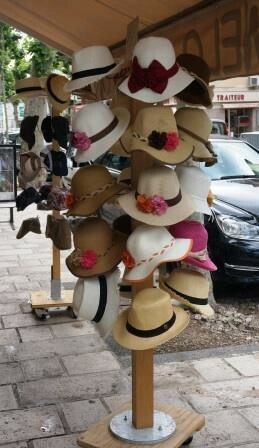 On my recent trip to France, I was delighted to see that dressy summer hats were IN, and what was I working on but the two remaining hat bands shown in my recent blog. I put the American Indian floral design on a hat for my 3-year-old granddaughter. The hat band was longer than needed so I overlapped the ends when sewing it on the hat. That way, as she grows I can change the band to a larger hat. This design makes me think of weddings. 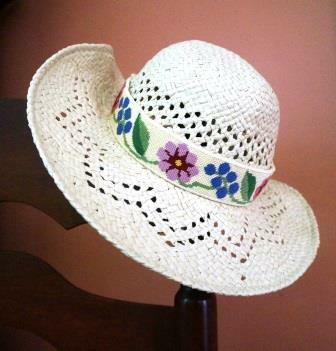 Imagine a summer wedding with bridesmaids and flower girls in straw hats with floral needlepoint hat bands! 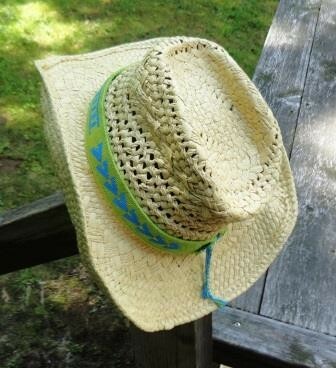 The Hawaiian Shark Tooth tattoo custom needlepoint hat band went onto an adult straw western hat. 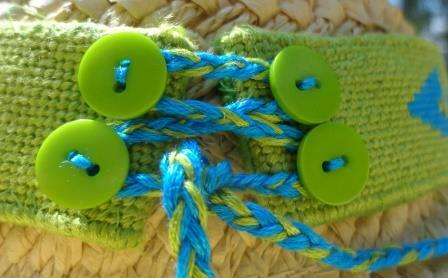 The band was a little smaller than the large hat so I made an adjustable button closure with braided thread to match as shown in the detail below.